Officiating Consultant, Paul Barno and Jay Kinzel During Sunday, April 11th shooting camp, Officiating Consultant, Paul Barno lectures on “held balls” using Edgewood’s Jay Kinzel as a demonstrator. 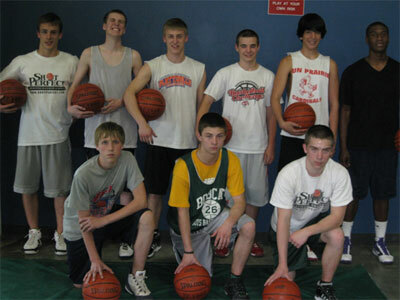 April 11, 2010 Shooting Camp Participants (Back Row) standing left to right: John Scheidermayer, Junior - St. Ambrose H.S. ; Jay Kinzel, Junior - Madison Edgewood H.S. ; Ryan Kalsow, Junior - WI Heights H.S. ; Walter Grosenheider, Sophomore - Madison Edgewood H.S. ; Dan Roth, Junior - Sun Prairie H.S. ; Malcolm Williams, Junior - Madison East H.S. – (Front Row) kneeling left to right: Frankie Hozeska, 8th grade - Burlington, WI. ; Bryce Kerslher, Sophomore - Florence H.S. ; Vince Breitzke, Sophomore - WI Heights H.S.